TIF TALKS BOOKS: Announcing the #SchoolsOutRAT (School's Out Readathon)!! 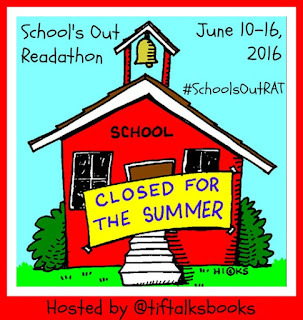 Announcing the #SchoolsOutRAT (School's Out Readathon)!! Good Wednesday Morning! As I write this, I am rejoicing in the fact that there are only 2 days left of school, and then both my kids and I get a little summer vacation! I have some trainings here and there throughout the rest of the month, but I cannot wait to be able to catch up on some sleep and more importantly, catch up on some much needed reading and relaxation!! And, speaking of reading . . . I've decided to celebrate school being out with a little readathon -- the School's Out Readathon or in social media, #SchoolsOutRAT. The readathon will run from Friday, June 10 through Thursday, June 16. Specific times will be vary based up your own personal time zone, midnight to midnight. There are no other parameters. Just read, relax, and celebrate in the joy of starting the summer vacation! Be sure to share your intention to participate, your reading updates, and more using the hashtag #SchoolsOutRAT throughout social media. To officially sign up, complete the linky below. A blog is not required, but I do encourage you to share the link that you intend to use for sharing updates. I would love to stop by and cheer you on. All official participants may also be entered to win a prize. Be watching here on the site for more information coming early next week! So, determine your stack (or not), and join in the reading fun! I will be back here soon to share my own stack. Will you be joining in the #SchoolsOutRAT fun? Mari Reads ... Yay!!! So glad to have you! Sounds great! Nothing like lying around reading to get out of the heat and celebrate no school! Jenny ... That's right! One more day left of school for us. Can't wait for a little break, especially one filled with books! Michelle Miller ... I really enjoy Eyes of the Dragon! I hope you and the boys enjoy it too!! Thanks for joining in! No pressure this week, so just read what you can and have fun!! Misty Mathis ... Yay!! BTW, your link listed above only goes to the general Goodreads website. Do you want to share your profile page instead? Alas, we aren't out until the 17th so I'm crazy busy with last week things, especially with a graduating 6th grader. Have fun reading! I'll be watching with envy. Kristen M. ... I'm always so shocked every year that you go so late into June, but I think you also start later than we do. Have fun and congratulations to you and your son! We will be there next year!! It's a crazy time. I didn't anticipate so many emotions but, whew, it's tough! Kristen M. ... I think I'm going to be a mess next year for my boy! I'm debating whether I should joint his or not. I really want to join, but I'm worried I won't be able to read much. Kami ... Join!!! If you don't get in as much as you want, that's okay. It's a low-key, no-pressure week!